Bank of America and Goldman Sachs are among 22 financial companies accused of colluding to rig Treasury securities auctions in a lawsuit filed by investors. 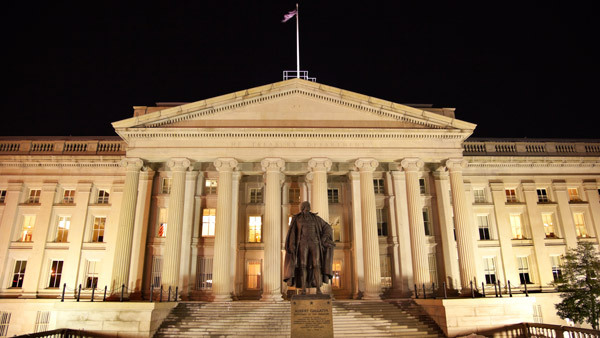 The Treasury building in Washington. Bank of America Corp., Goldman Sachs Group Inc. and JPMorgan Chase & Co. are among 22 financial companies accused of colluding to manipulate auctions of U.S. Treasury securities in a lawsuit filed by investors. A pension fund for Boston public employees alleged the so-called primary dealers used electronic chatrooms and instant messages to inflate the prices of treasuries they sold to investors and to deflate the prices they paid for those treasuries at auction. The U.S. Justice Department has begun looking at possible collusion in the $12.7 trillion U.S. Treasury market after securing guilty pleas and $6 billion in fines from global banks in a similar investigation of currency rigging. Dozens of times a year before the Treasury holds an auction, salespeople at 22 primary dealers field billions of dollars in bids for government debt. Traders working at some of these financial institutions have the opportunity to learn specifics of those bids hours ahead of the auctions, several people familiar with these operations said last month. Lawrence Grayson, a spokesman for Bank of America, Tiffany Galvin, a spokeswoman for Goldman Sachs, and JPMorgan spokesman Joe Evangelisti all declined to comment on the lawsuit. The case is State-Boston Retirement System v. Bank of Nova Scotia, New York Agency, 15-CV-05794, U.S. District Court, Southern District of New York (Manhattan). — Check out Making the Case for High-Yield Bonds Before the Fed Rate Hike on ThinkAdvisor.